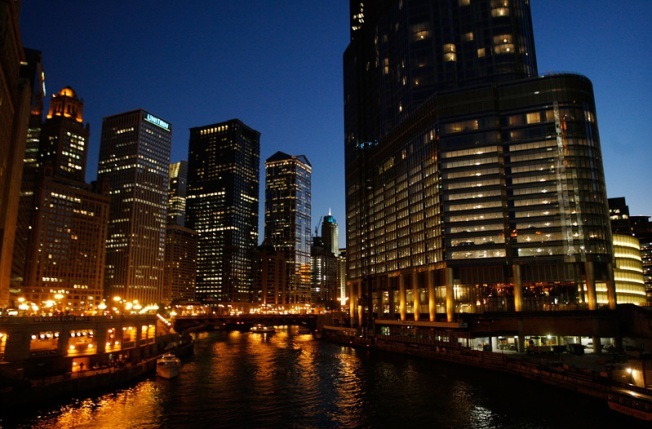 The Trump Tower sits along the Chicago River in the city's business district. The 92-story hotel and condominium development currently under construction was topped off with the last of 180,000 cubic yards of concrete on Saturday. Lake Point Tower seems to be losing its reputation as Chicago's high-rise locker room, as Trump International Hotel & Tower sees another pro-ball name sign for one of its exclusive residential condominiums. Crains Chicago Business reports that Cris Carter, the former Minnesota Viking who's now working for ESPN, will be neighbors with Blackhawks superstar Patrick Kane and sputtering Chicago Bears quarterback Rex Grossman. The price tags? Crain's said Kane paid $529,000 for his Trump condo and Grossman's home had a sticker price of $825,000. State-of-the-art workout facilities, a health spa and swimming pool are big lures at Trump Tower. But so is the high-profile high-rise itself. "These guys have a short time in the limelight, so they take advantage of it while they can," said local sports and talent agent Steve Zucker. "It's part of the package. They get used to people looking up to them, and there's no place like a high-rise." Read more from Shia Kapos, with Crain's.